Rebecca Raffell was born in Karlsruhe Germany to German-English parents and was introduced to opera from very early age. After moving to Oxford in 1991 she joined the Junior Drama Department at the Guildhall School of Music and Drama in London. 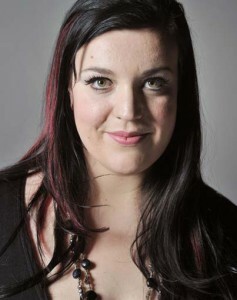 In 1997 she commenced vocal training with Jean Allister FRAM FGSM. Later she won First Prize in the Oxfordshire Young Performers Competition and the Birmingham Young Singers. Rebecca was 18 when she auditioned for a place at The Guildhall School of Music and Drama and won a scholarship for vocal studies with Professor Rudolph Piernay and later with Brian Parsons. She performed roles in College productions such as Erriclea IL RITORNO D’ULISSE IN PATRIA, Nutrice L’INCORNAZIONE DI POPPEA and in Opera Scenes she sang Gaea DAPHNE, Dritte Dame DIE ZAUBERFLÖTE, Principessa SUOR ANGELICA, and Mrs. Sedley PETER GRIMES. She was Marcellina LE NOZZE DI FIGARO for Southbank Sinfonia with Simon Over in France. There after Rebecca completed the Opera course at Guildhall, she performed for the first time with the Junge Oper at the Staatsoper in Stuttgart Germany in the world premiere of ERWIN, DAS NATURTALENT by American composer Mike Svoboda. She was invited to sing another world premiere at the Festival in Schwäbisch Hall Cupido FIGARO VOR HOCHZEIT by Svoboda/Mozart. Rebecca appeared in yet another world premiere at Staatsoper Stuttgart singing the role of Mum in Matthias Heep’s opera TRÄUMER. Other engagements included the Sorceress DIDO AND AENEAS, the Owl in the German Premiere of THE CRICKET RECOVERS by Richard Ayres, Fafner SIGURD DER DRACHENTÖTER, Mistress Quickly FALSTAFF, Dritte Dame DIE ZAUBERFLÖTE, Filipjevna in EUGENE ONEGIN, Mistress Quickly FALSTAFF at the Staatstheater Wiesbaden and Stimme der Mutter LES CONTES D‘HOFFMANN at Deutsche Oper am Rhein Düsseldorf. She has recently performed Arnalta L’INCORONAZIONE DI POPPEA and Die Stallmagd KOENIGSKINGER at the Semperoper Dresden. Since 2011 Raffell has been a member of the ensemble at Staatstheater Karlsruhe where her roles have included Anna LES TROYENS, Boulotte RITTER BLAUBART, Cleone ALESSANDRO, Mary DER FLIEGENDE HOLLÄNDER, Erda, 1 Norn, Schwerleite DER RING DES NIBELUNGEN, Auntie PETER GRIMES, Marquise de Berkenfield LA FILLE DU REGIMENT, Amme BORIS GODUNOV, and Der Tod LE ROSSIGNOL. In 2015 she sang Stallmagd KÖNIGSKINDER by Humperdinck at the Semperoper in Dresden and Filypjewna EUGENE ONEGIN at the Aalto Theater in Essen from 2012-2015. Since September 2015 Rebecca is singing ‘The lady of the Lake‘ in Monty Python’s SPAMALOT, a production due to run until 2018 in Karlsruhe. Upcoming engagements in 2016 include her debut at the Deutsche Oper Berlin in the new production of VEC MAKROPULOS by Janacek, conducted by Donald Runnicles, DIE ÄGYPTISCHE HELENA by Richard Strauss and in 2017 Mary THE FLYING DUTCHMAN, Schwertleite DIE WALKÜRE, Bronka DIE PASSAGIEREN by Weinberg and Stallmagd DIE KÖNIGKINDER.